Shelley Schmidt is an American surface pattern designer, illustrator, and maker living in Atlanta, Georgia. She specializes in creating playfully-patterned, contemporary designs that make people smile! Shelley also designs under her studio's name: Studio Schmidt Designs. In love with art since she was old enough to hold a crayon, she sharpened her design skills at Dominican University in Chicago, earning dual degrees in apparel design and apparel merchandising. 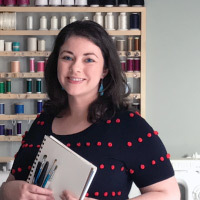 After working for several years in various design and product development positions within the fashion and textile industries, she made the decision to open her own design studio so that she could pursue her true artistic passions as an illustrator and surface pattern designer.